There’s just something about a pretty day in the South that makes you want to go out for a drive. Spring starts earlier here than most other places and when that time comes that the weather is at a perfect 70° and things are just starting to bloom, something deep inside of you makes you want to go out and see the changes for yourself. When pretty weather and Sunday happen to find each other, it’s the perfect recipe for a ride through the countryside. When I was a kid, one of my favorite family traditions was to take Sunday drives (well, for me it was a ride) and I must have gotten that from my grandfather. After the big weekly Sunday meal at their house, it was sometimes hard for the family to stay awake and an outing was a sure way to get everyone’s blood circulating and the lungs full of fresh air because we didn’t necessarily take a Sunday drive in the car. We more often than not went in the pickup truck. The pickup truck, the ubiquitous tool of the Southern man, that vital apparatus so necessary to Southern living was, in most cases, a work truck used for hauling off tree limbs and trash, picking up bags of fertilizer, taking the lawn mower to the service center and picking up supplies for the family restaurant. On a Sunday afternoon however, the pickup truck was the center of a family fun outing that to this day brings back memories of a simpler time and a more leisurely way of life. Pickups came and went as he liked to trade them every couple of years but in every case, the tailgate always said “Chevrolet” and was almost always down. Since Dad usually had to work the Sunday shift down at Fresh Air Barbecue, he rarely got to come for Sunday dinner at my grandmother’s house, leaving Mom to look after my brother Chris and I. In addition, there was my Aunt Charlotte and her two sons, George and David, who were my first cousins, plus of course my grandparents to round out a total of eight going off in the pickup truck. My grandfather always drove and my grandmother and Aunt Charlotte would get in the cab of the pickup while my Mom, who preferred to be outdoors anyway, always rode in the back with the four of us and kept us from doing something stupid like falling off the tailgate. 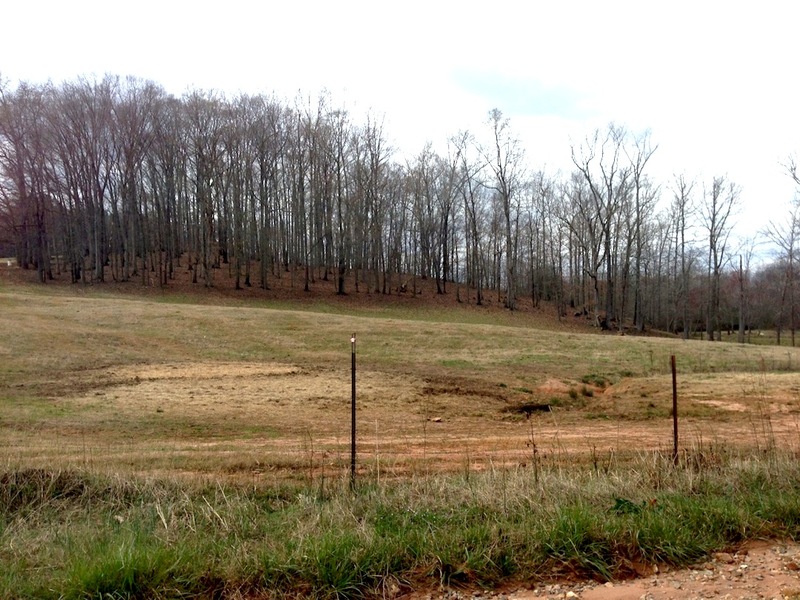 Back in those days, which really wasn’t that long ago, most of the roads north of Jenkinsburg and in other remote parts of the county were dirt roads. Long, dusty ribbons of red Georgia dirt, they meandered through the farmlands, pastures, forests and pecan orchards that still made up so much of my part of Georgia in the 60’s and 70’s and there was no better time to enjoy them than during the early springtime. The exhilaration of riding in the open air on the tailgate of a pickup truck was, for a kid, enough to overcome the stupor induced by an overindulgence of homemade biscuits and fried chicken any time. We’d ride up Oak Road, past the big silo and ramshackle barns, yelling at cows and just being noisy in general. We never felt we were in any danger as we watched the road glide by under our bare feet because my grandfather never got above 20 miles per hour. It was a nice, slow pace watching the world go by backwards as clouds of red dust billowed up behind us. We never knew where we were going but we certainly knew where we had just been. If we got too noisy my grandfather would toot the horn or holler out the window at us. None of his trucks had air conditioning until the 1980’s so the ones sitting up front got plenty of fresh air too. I can just imagine my grandmother’s mortification at the horn blowing and his rather loud voice adding to the noise come from the back. We honestly looked like the Walton family from television albeit 35 years later in history. Sometimes we’d stop along the way so he could speak to a farmer or someone else on the road that he knew. We passed by old farmhouses, some dating back to the 19th century, big houses painted white with inviting front porches and a tire swing in the front yard. We rode over old bridges made entirely of wood that looked like they were on their last leg and which induced the only moments of fear on the journey as I was sure we were all going into the river this time. We almost always stopped somewhere on the way to pick up some fresh vegetables that he didn’t grow in his own garden such as corn, okra and squash. These stops introduced us to some interesting people and gave us a chance to stretch our legs a few minutes before it was back into the truck and on to the next destination. It was easy back then to ride long distances on dirt because so many of the roads were still that way and if we touched pavement on our Sunday excursions, it was usually just crossing over one road to continue on to the other side. These were special trips with special people who made memories I will never forget. Today seemed like the perfect day for a dirt road drive. The weather was partly sunny with only a little wind and the temperature was dead on 70°. The only thing missing was a Chevrolet pickup truck and the rest of my family to make it perfect. One problem was easy enough to solve though. I went and got my grandfather’s pickup truck. 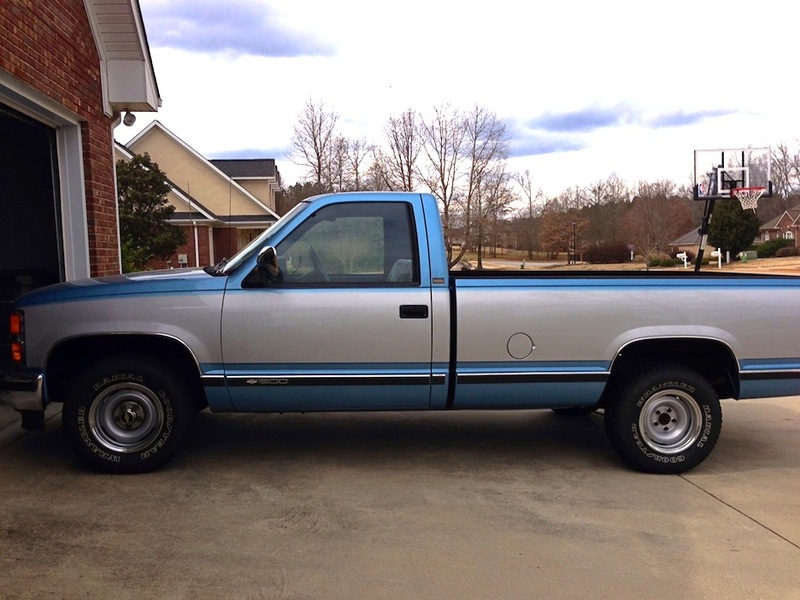 The old blue and silver Chevy, now 26 years old, roared to life after a couple of pats to the gas pedal and within a few seconds, all eight cylinders of the big 350 cubic inch motor had settled down into a harmonious rhythm. My grandfather’s last truck was somewhat of a departure from all the previous workhorses he had owned over the years. I don’t know if he thought it would be his last one or if my grandmother had finally won the battle and convinced him to buy one with a few creature comforts but whatever the case, he went all out on this one. His 1988 model, which he bought in March of 1987, had about all the bells and whistles a pickup truck could have back then, meaning it had air conditioning, power windows and power door locks, plus a radio that had both AM and FM. It even had a cloth bench seat instead of the usual sticky, hot vinyl seats his earlier models had. For a man who loved his Cadillacs, he sure hated to spend money on a truck but this time he did, whatever the reason and he meant to get his money’s worth out of this one. He drove the truck for nine years, right up to the day before he left us at the age of 89. No one even entertained the thought of selling the truck after he died and the very thought of doing so never entered my grandmother’s mind. Instead, it became something of a family pickup, the kind everyone borrows when they need a truck. I’ve used it many times myself, including two moves, numerous trips to Home Depot for fertilizer and any number of pickup-related tasks. Whenever it was needed, the Chevy Silverado was ready for action, including the occasional dirt road trip. After my grandmother died, Mom became the caretaker of the pickup and it spent part of 2011 and much of 2012 undergoing a complete restoration. The original interior, except the headliner, was fine but General Motors seemed to forget everything they knew about paint in the 80’s and the Chevrolet’s exterior was a prime example of what happens when good paint goes bad. The bed was removed, everything was scraped and primed, new rubber door seals were installed, a new headliner was added and the air conditioner was rebuilt. Add to that a new paint job and the pickup was in better condition than anything that rolled out of Detroit back then. My wife and son climbed in and all three of us rode comfortably on the wide, flat bench seat as we headed out in search of a dirt road. Fortunately one was close by and within minutes, we were crawling along with the speedometer perched at 20 mph and dust billowing behind us as the vistas unfolded before our eyes. We passed by farmhouses, some quite modern and new compared to the ones I remembered. We drove by tranquil creeks and pastures full of lazy cows also enjoying the pleasant weather. Bradford pear trees were in abundance and they were at about 80% of full bloom. Here and there, flowers poked out in places, as their roots drew water from the still-saturated soil, moist from an abundance of rain in the preceding weeks. Some of the roads we used to travel aren’t dirt anymore and we spent almost as much time on paved roads getting from one dirt road to another but they are still in abundance and we enjoyed each one of them. The old pickup performed beautifully and I felt like my grandfather was along for the ride. The silo is still there on Oak Road and the barn nearby; other old barns have long since collapsed and many have been replaced with metal ones that serve the purpose but are bereft of the old country charm exhibited by their predecessors. Another change was the fair amount of signs warning trespassers that they were under 24-hour camera surveillance. Someone was sure making a lot of money from signs at least, if not video cameras too. Still, despite the encroachment of modern life, the country is still very much the country and the beauty of the trees, the openness of the pastures and the renewal being brought on by Spring was very much in existence. 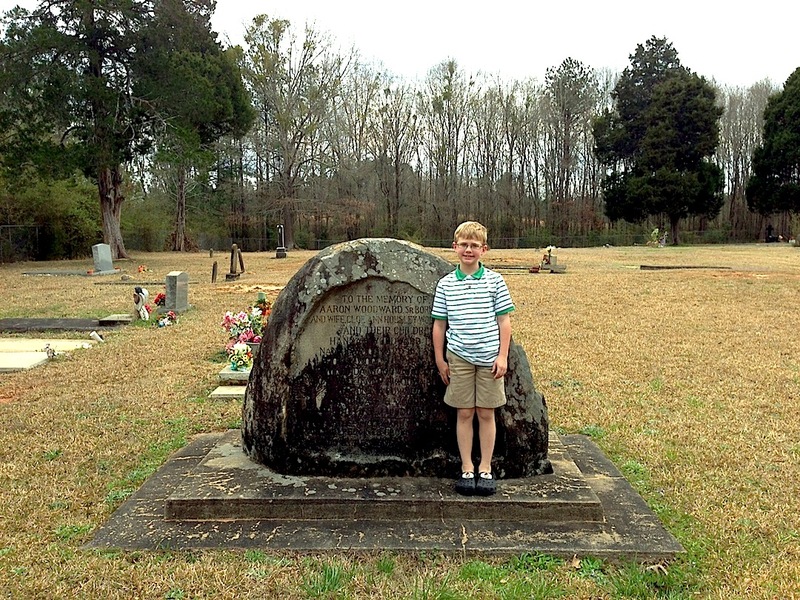 We eventually wound our way over to the western side of the county and decided to pay a visit to the old cemetery where my great-great-great-great grandparents are buried. Born in 1770, my 4x great grandfather was one of the original settlers to our area and since his time, eight generations of his family have lived here. I made it a point to get a picture of my son while we were there standing next to the monument to people seven generations removed from him but every bit as responsible for his being here as I am. After that we enjoyed the rest of our drive and getting to spend some time together seeing nature in a different way. 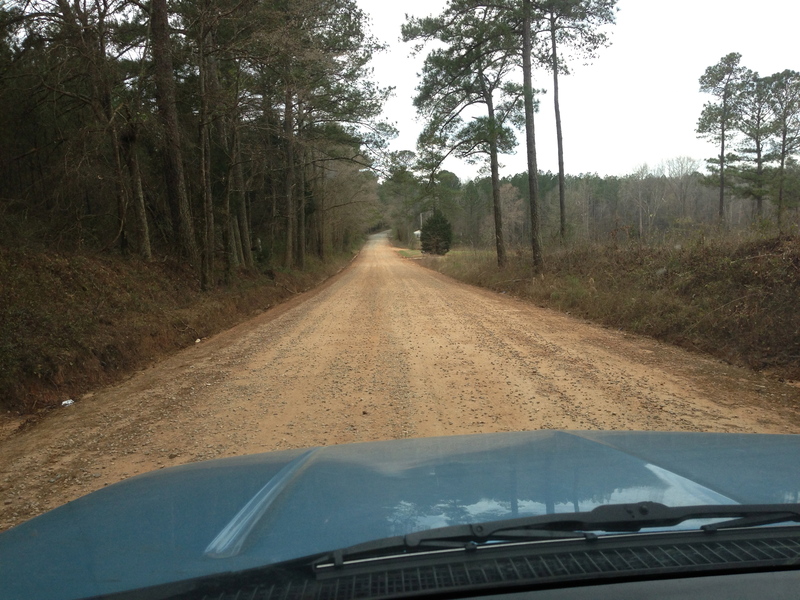 Dirt roads are a lot like paved roads in that they can take you from one place to another, just in a different way. How they differ is in the perspective that they offer that is hard to get anywhere else. They force you to slow down your pace a bit and in doing so, they reveal the beauty of nature and the handiwork of God all around you. You notice things on dirt roads that you won’t see on a highway or an interstate because you can actually pay attention to what is around you. You can stop and smell the air and enjoy being away from traffic jams and convenience stores and you won’t miss them either. You won’t (usually) see someone driving 60 on a dirt road (there are fools occasionally though) because they just aren’t designed for that. They are pathways that take us back in time to a simpler way of life and a more measured pace of living. Sure, they are dusty and when it rains they are muddy and can sometimes become impassable. They often aren’t wide enough in places and they can easily be damaged by the elements and those that abuse them. You might get bumped around some and you sure won’t get anywhere in a hurry but isn’t that the point? Dirt roads remind us to do what we should do more often…to enjoy the time we are given with those we care about, to notice the beauty that surrounds us everyday, to think back on good times and special memories and to always anticipate what lies around the curve ahead. I was reading this when your comment on my post arrived. I really enjoyed this one. My family doesn’t have roots in one place like yours does, but I did get to ride in the bed of my grandfather’s ’72 Dodge truck down the dirt and gravel roads of southwestern Michigan, where he and my grandmother lived. Of course, spring comes a whole lot later in Michigan than it does in Georgia. I think it’s against Michigan state law that any country road be straight. Fools who tried to drive them at 60 mph didn’t stay fools for long, as they didn’t survive it. I know what you mean. Fortunately for those who do survive driving them that fast, there is usually a friendly farmer with a tractor close by willing to pull them out of whatever they get themselves into! I really enjoyed reading your story Michael. It took me back to my own childhood there in Jackson. Thanks Chip. Ironically in my position, getting dirt roads paved is part of the job I still appreciate the way of life they represent. Of course, I don’t have to live on one and deal with the downsides either! 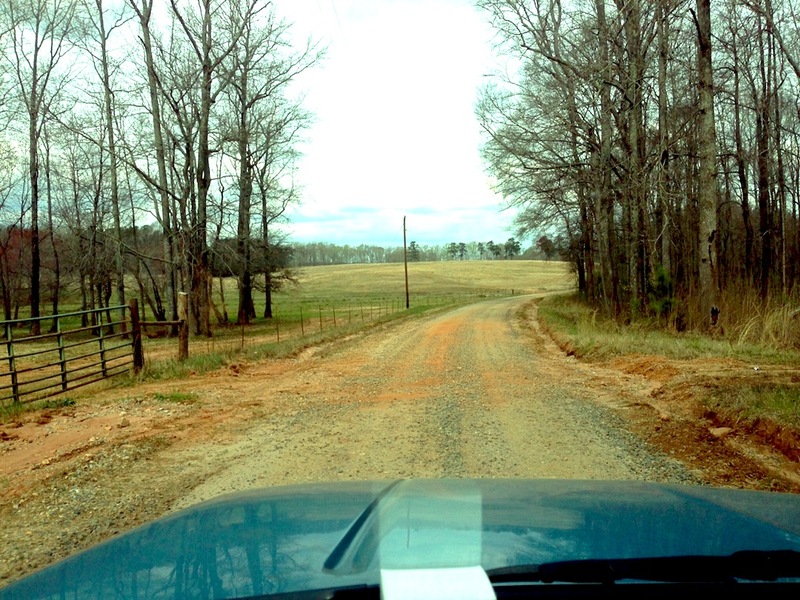 I’ll take a ride down an old dirt road in the country over one on a paved highway every time. It’s much more interesting, the scenery is far better and you end up feeling refreshed, rather than stressed. You did a nice job highlighting one of the benefits of living in or near the country. Thanks so much. I didn’t mention in my article the one modern gadget that helped yesterday…the built in GPS in my cell phone. A few roads had been so long in the past that I couldn’t remember where they came out! The thing is, our grandparents had the equivalent of a GPS in their heads. They knew where every road came out and where everyone lived – or used to live. Very true! I know mine certainly did.